We are now home. The doctors said that my incision looked good, took out my staples, and discharged me on Sunday. Our nurse on Mother/Baby knew that we have kids in the NICU, and kindly offered to let us stay until the end of her shift rather than having us leave at the normal discharge time of 12:00pm. We were so grateful to have until 7pm with a room just down the hall where we could grab a quick nap in between spending time with our kids. It still didn’t make going home any easier though. Home doesn’t quite seem the same as how I left it five weeks ago. The evening I left, I really thought that I’d be back home within a matter of hours. It is so strange to be home and not be pregnant anymore. Sean and I both agree that it doesn’t feel entirely “real.” It’s so obviously quiet, that we don’t know what to do with ourselves. No more beeping machines, nurses coming in to take my blood pressure, or early morning visits from the OB-GYN resident. Even Sean notices how quiet it is since this is the most time he’s spent here since I was admitted. He’s used to the hospital sounds also. What it really boils down to is that we both notice that something is missing...and they are back at the hospital in incubators. In many ways, we both wish that I was still hospitalized so that we could be just down the hallway from our babies. At the same time, it’s incredibly nice to be home! Nothing beats sleeping in my own bed. And it has been wonderful to wake up next to my husband the last two mornings! I’ve missed both of those! Other than getting up every 2-3 hours to pump, I sleep like a rock here. Real, solid sleep was hard to come by in the hospital. The biggest news with our babies has to do with their PDAs. All four babies have a blood vessel behind their heart that is open. Normally, babies have this open blood vessel to allow blood flow from the heart to the rest of the body while skipping the lungs (because they aren’t being used) and as they near 40 weeks of gestation, the blood vessel closes. However, in preemie babies, they haven’t had a chance to get to that point yet. Right now, that blood vessel is directing blood away from the lungs, but since they are being used, it needs to go there! The cardiologist did heart echoes on the babies yesterday, and it looks like Caleb and Elijah both have blood vessels that are small enough that they should close on their own. However, Ellie’s blood vessel is very large, and Abby’s blood vessel is on the larger side also. Both of our girls started medication today that will hopefully close it. They will receive three doses of the meds over the next 36 hours, and then the cardiologist with do another heart echo on each of them to check the size of the opening. If it doesn’t work, they can repeat the round of medication a second time. If it doesn’t work at that point, then we are looking at possible surgery. 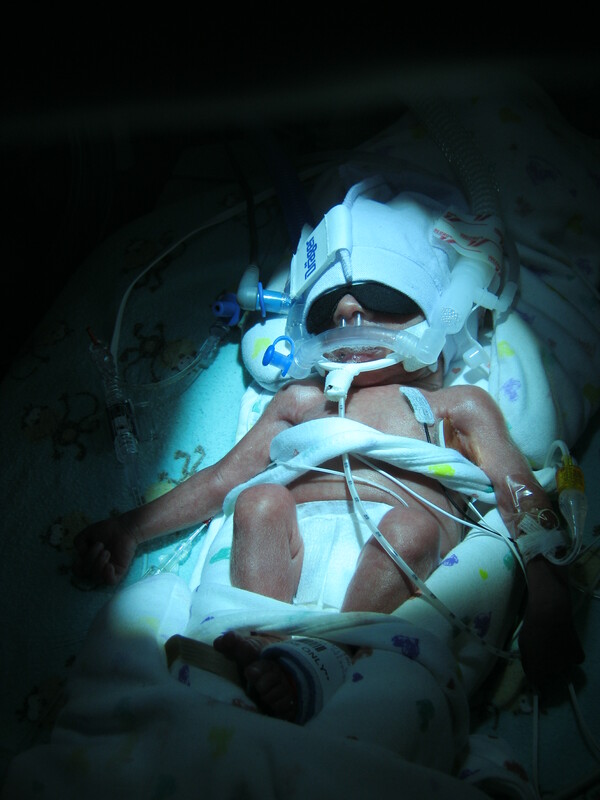 The doctors have very specifically told us that this is a normal problem for preemies of this age to have. We are praying that the meds work for the girls and that the boys won’t need any intervention at all. We have already become friends with another couple in the NICU. Sean’s cousin, Michelle, found Ryan and Natalia’s blog while I was on bed rest and forwarded it to me since they have a son, Beckett, who is currently in the NICU at Saint Luke’s. I looked at the blog and then left a comment on it saying that our kids would most likely be hanging out together since they would be heading that direction when they arrived. Natalia saw my comment and we started emailing back and forth a week or two prior to our babies being born. Three days after we arrived in the NICU, Natalia and I were able to meet in person, along with our husbands, and a new friendship was created! On Sunday, Ryan and Natalia stopped by our rooms to check on us. Sean and I were having a hard time knowing that I was being discharged and we would be leaving our babies. Natalia came up to me, gave me a big hug, and told me that it would be hard but that the babies were getting the best care. What a blessing for us to have such an understanding and encouraging couple to talk to on the inside! They also bought two books for our babies, “Good-Night Moon” and “How Much do I Love You?” Parents of NICU preemies are very limited in what they can do, but Ryan and Natalia told us that reading to Beckett was something that they’ve done quite a bit. They wanted us to be able to do the same thing with our babies. Thanks for the update! Praying for Caleb, Abby, Eli & Ellie and continuing to pray for baby Beckett to grow as well. Love you guys! Leaving them and going home alone was the worst! I definitely should have listened to everyone and rested because 17 months later I am still in need of extra rest! Thats good you've gotten to go home. We know its hard thinking about your babies still at the hospital. But you two will need to get busy and getting the house ready for the arrival, because once they come home you'll pretty much be home bound for awhile. Now would be a time to start stocking up on preemie formula, diapers, wipes and other items. Does St Luke's have an overnight room for NICU parents? KU had 2 rooms, they were very tiny and you had to request them. They usually reserved them for parents to stay if they were going to be discharged the next day or had surgery, and if they wasn't reserved you could request one. Thats good you have met the some other parents there at the NICU, we had met and gotten to know alot at KU also. KU also has an annual NICU reunion which is coming up in April. You'll have a house-full of littles very soon! Just rest up and take care! I understand this has to be a hard time, but think of it as a lesson in patience. You just have to wait sometimes for the things you want the most. So you have a bit of down time now, while the babies are in very trusted hands, to heal and prepare for the best job you'll ever have! blog for Baby Beckett and he and his family will be added to my prayer list also. Praying for all 6 of you. Rest and enjoy each others company while you can - before you know it there will be no rest and you two will only be waving at each other!! JoLee is right. It absolutely is the best job you wil ever have!!! I am so happy for all of you! I will continue to pray and I am still Team Ellie :) I cannot wait for more updates, please stay in touch. Thank you for the update. We are still praying. Praying you are feeling stronger and able to enjoy next Saturday. Congrats on the arrivals of your beautiful babies! As Beckett's aunt, just wanted to let you know that his family is praying for yours as well. May God grant you strength in this time of separation from your little ones and give them the strength to mature and grow so that soon you will be wondering what a quiet house was like. God Bless! We would love to hear what you think! Please know that all comments are on a slight delay as we approve them on our end. Thanks for commenting! Thank you so much for dropping by to visit! I'm Rebecca, the proud mama of Kansas City quadruplets born on February 23, 2011! This blog started as a way to keep our friends and family in the loop during our pregnancy and has been continued as a way to document our crazy, wonderful, blessed life! **HOT DEAL!!! ** The Ultimate Homemaking Bundle & Giveaway! !